Recently, I received an email from my niece, Kerry O. Furlani. Kerry, an artist, spent three intensive months studying in Wales under a master letter carver, and now has settled in Vermont. A talented artist sponsored by the Vermont Arts Council, Kerry has been recognized for her ability to carve letters into stone. I recently received a brochure of her new collection and noted Kerry carved “Never cut what you can untie” in one of her stone pieces. I quickly applied that quote in a literal sense as I have far too often grabbed a pair of scissors and cut a price tag off a garment. In my haste, I cut into the garment or opened a seam. I have also grabbed the scissors quickly to open a bag of shredded mozzarella cheese, and too often cut into and destroyed the re-seal feature, rendering the unused cheese wasted. 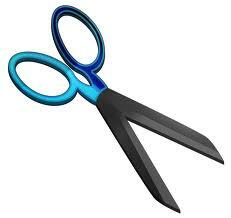 The work of the scissors is rather final, once the cut is made, the object is forever altered. Glue may come in handy to repair a paper item, bringing it close to its original state. However, all women know glue is of no value once our hairdresser takes a scissors to our hair! That cut is final! The price tag, shredded cheese, and hair examples came to mind quickly and yet something was gnawing at me when I read what Kerry felt was important enough to capture forever in a piece of stone….What was it? What was the meaning for me? Once I dropped the literal interpretation, I knew that seeing this phrase in the brochure was not a chance happening for me. You see, sometimes I have cut what could have been untied and now I cannot get it back. One example that came to mind is a relationship with an older man I dated a few years ago. He was as romantic as I have ever known a man to be. He was fun, full of surprises, and could make my heart skip a beat just wondering what he would do next. But after many months, it may not surprise you to know he found me “mentally and physically exhausting!” While many of my friends considered that a compliment, I cried, he left, and we have never seen one another since. I recently sold my condo and am in the process of finding a home in the city. When I leave here, I have to be careful to just “untie” the relationships, not cut or lose them. That will take work as I move physically away, but I know the ramifications of cutting what I could have untied–I am not going to repeat that mistake. As women with high SUCCESSTROGEN levels, we are skilled at untying, respecting that sometimes they need to move away from someone or some thing. After careful consideration, we decide whether to cut or untie before moving on. Some relationships are harmful and must be cut. But there are those we truly value, and those we will just untie, knowing that we may circle back in time and tie again. And you? Are you aware of some relationships you have cut? Was that the right answer, or should you have just “untied” them? Afterr all I’ll be subscribing on your feed and I’m hopling you write agawin soon! best websites online. I’m going to recommend this web site! pay a visit this weeb page, it includes precious Information. Hi there! This article could not bee written any better! Looking att this post reminds me of my previous roommate! He always kept preaching about this. I am going too forward this post to him.